NYNKE comes from Friesland and sings in Frisian, a language with a rich history and a great poetic quality, which is only spoken in the northern part of the Netherlands and is considered by linguists as somewhere halfway between English and Dutch. For a number of years, Nynke has been passionate about Mediterranean and Latin music, from fado and flamenco to various Latin American traditions and has created her own “Mediterranean-Frisian” style, inspired by these musical forms and sung in her mother tongue. She has recorded three albums – all extremely successful in the Netherlands, resulting in a gold disc, an Edison (Dutch Music Awards) and a literary prize. 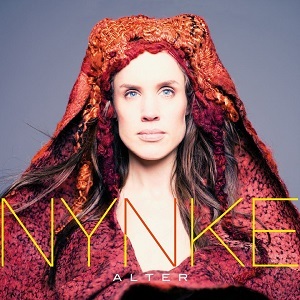 All the songs on the album are written by Nynke, with the exception of ‘Foarjiersfers’ (based on a poem by Rutger Kopland, translated by Nynke), ‘De Brulloft’ (a cover of a song by Lhasa de Sela, translated by Nynke) and ‘Eftereach’ (co-written with Frisian poet/performer Tsjebbe Hettinga, whose voice appears in the piece). With her distinctive style of poetry, Nynke has created a kind of hymn to Spring, to love, birth, nature and the moods and feelings inspired by those broad Frisian landscapes. Nynke has a great commitment to cultural diversity and her music strives to preserve and develop one of the few minority languages left in Europe. This is an album that is inspired by the language, the landscape and the poetry of Friesland. The word ‘Alter’ has various meanings – in Latin it means ‘other’, in English ‘to change’ or ‘transform’ and in Frisian it means ‘altar’ so is connected to the rituals of life. All three meanings of the word seem relevant to Alter.